Beach access on St. George Island + hatchout! I've heard people say that the only property they would consider having on St. George Island is beachfront, so that they have access to the water, but a little exploring will lead you to find easy public access to the beach on St. George Island from almost anywhere on the island. On the East End of the island, there are boardwalks every few blocks with signs posted indicating beach access. In the Plantation, on the far western end of the island, boardwalks to the beach have been built and are maintained by the Plantation at the end of each street, with cleared pathways cut between streets leading all the way out to Leisure Lane. So, easy beach access is possible even from the north side of Leisure Lane. In the middle of the island, called the Gulf Beaches section, it's even easier. There is beach access between virtually every beachfront property, and mid-block through to Gulf Beach Drive. Some of these access points are cleared and maintained, some are not, but they are there. And, at the end of every street, there is a wide beach access open to the public, and many of these have boardwalks. The beach itself is public property on St. George Island, and the folks who originally platted the island did a great job of making sure there is established access to the beach for every property owner on the island. When you get interested in a particular piece of St. George Island real estate to buy, be sure you check out the beach access you would have, and I'm sure you will be pleasantly surprised, regardless whether you choose to buy on the beach side or the bay side! 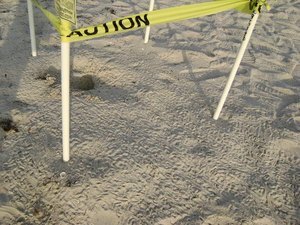 Baby turtles have almost the perfect beach access, as long as we don't interfere. Since I last wrote, three of the nests I am monitoring hatched out, with babies exiting the nests and heading to the water. 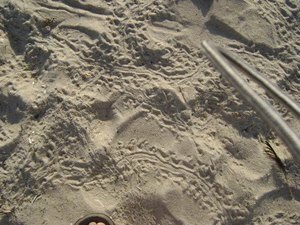 You can see the baby tracks in the pictures to the right - they are miniature versions of their mama's tracks. When a hundred or so babies emerge from a nest, they leave a mini freeway of baby tracks that are unmistakeable when you see them on dawn patrol. Unfortunately, a lot of the babies this weekend were pulled eastward toward the downtown glow of lights from our commercial district. Many of them eventually made it to the water, but some fell victim to crabs and other predators as they crawled parallel to the water instead of directly to it. 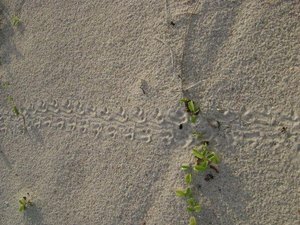 When you see baby tracks crossing other baby tracks as in the last picture, you know nature is not taking its normal course!